Hampton, NH – This spring, 65 volunteers, including 45 fifth grade students from Seabrook Middle School, used their hands to help build resiliency in the Hampton-Seabrook Estuary. They enthusiastically planted more than 2,600 beach grass plants in a beach grass nursery garden at Hampton Beach State Park. The plants in this garden will be used to replant and restore trampled dunes at other sites within and near the park this fall. 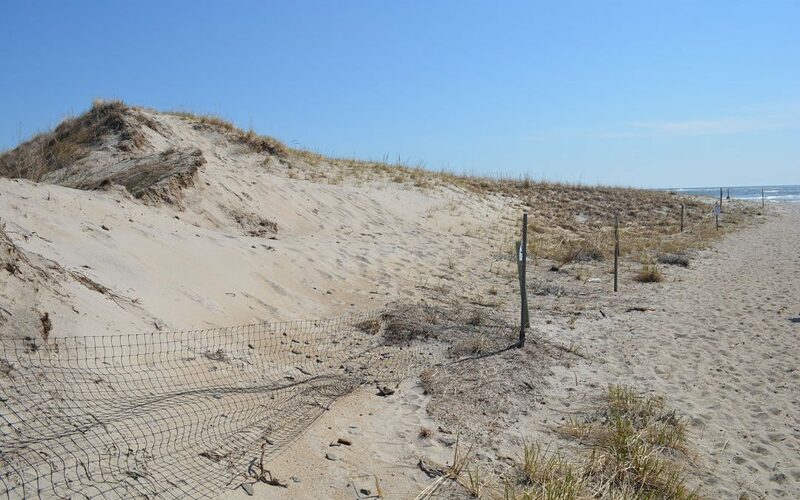 Restoring dunes is one of the many faces of shoreline management, a general term used to describe both structural and non-structural ways to protect people, public and private property, and natural resources on and behind the shore. Left to right: Sage Marquis, Alyson Eberhardt (project lead from NH Sea Grant/UNH Cooperative Extension), Korrin Wein and Haley Eaton help plant a beach grass garden that will be used to replant and help restore sand dunes in the Hampton-Seabrook Estuary. Photo by Gregg Moore. Storms, wind and waves are a part of life on the sand dune, but the dunes can’t recover naturally and build back up their sand after a storm without the beach grass to anchor them down. Dunes are a natural buffer from storms and shield from flooding. With climate change comes the risk of more intense storms that have bigger and stronger waves, which threaten both the dunes and the property behind them. “The dunes are the first line of protection against storms. They hold down the beaches and protect the homes and businesses behind them,” said Alyson Eberhardt, project lead from the NH Sea Grant/UNH Cooperative Extension. Gregg Moore and David Burdick with the University of New Hampshire Jackson Estuarine Laboratory are also teaming up on the project. This beach grass has a big job to do: hold down the dune with its root system, called rhizomes, and keep the sand from blowing away. Without the plants to hold down the sand, wind and waves erode the dune unhampered. In addition to their erosion control ability, beach grass gives unique communities of animals, like shorebirds, insects and even rodents, a place to live. Photo by Cathy Coletti. The project is funded by a Resiliency Technical Assistance Grant from the Coastal Program at the N.H. Department of Environmental Services because of its contribution to safeguarding N.H.’s coast from erosion, flooding and storms. The funds are being used to manage the restoration, coordinate volunteers and work with the community and beach users to use designated walking paths to avoid trampling and damaging the dunes. Many of New Hampshire’s sand dunes have been destroyed by coastal development. The remainder of the dunes have been loved to death by people unknowingly walking off designated paths and trampling the grass on their way to the beach. “The Hampton-Seabrook Estuary was historically extensive and high functioning. Today dunes are patchy in distribution and what’s left is at risk of loss. Trampling is a big issue,” according to Eberhardt. So, how will the nursery be kept safe from human feet? Fencing has been put up around the growing plants to direct people away from them. Additional signs educating park visitors about the restoration project and why it’s important to stick to designated paths will also be put up. After the restoration work, four paths will remain for foot traffic between the parking lot and the beach. And more signs and fencing will be installed to direct beachgoers away from the grass and to designated walking areas. Speaking of human feet, in addition to being transplanted on the dunes, some of the beach grass in the nursery will be replanted on a former dance floor. This relic is sitting in the sand dune at Hampton Beach State Park and hasn’t been used since the early 1990s. The third transplant site will be at the Hampton Harbor Wildlife Management Area just down the road. This dilapidated wooden dance floor will be taken out by the State Parks Department and replanted with beach grass as part of this project. This relic saw happier days hosting square dances and other events on the beach, but today’s splintering wood would hurt anybody’s feet. It’s also sitting on prime sand dune habitat. Photo by Cathy Coletti. This fall volunteers will help transplant the beach grass grown in the garden to the damaged sand dunes. To connect with volunteer opportunities on this and other projects, contact Coastal Research Volunteers Program Coordinator Alyson Eberhardt at 862-6709 or alyson.eberhardt@unh.edu. This project was funded, in part, by NOAA’s Office for Coastal Management under the Coastal Zone Management Act in conjunction with the NH Department of Environmental Services Coastal Program.